Size of Male: 99-110 lbs., 25-27.5 in. Size of Female: 88-99 lbs., 23.5-26 in. Color: Black, lighter and darker shades of gray, lighter and darker shades of fawn, and red. Purpose: A property guard dog and large game hunter. The Cane Corso is an ancient Italian breed, descended from Roman war dogs. He has been used to guard property, cattle, and as a personal guard dog for centuries. The breed has also been used to hunt large game such as the wild boar. Today, this dog breed is a very affectionate dog and bonds closely to his family. He is excellent with children. 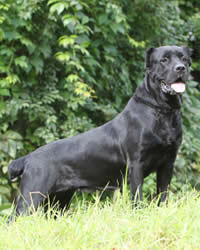 The Cane Corso is descended from the Canis Pugnax, or the old Roman Molossian used in battle by the Romans. This breed is lighter than the original ancient breed, however. In addition to guarding property, cattle and being used for personal personal, the breed has also been used to hunt wild boar in Europe. At one time the dog was common all over Italy and he was frequently found depicted in paintings. In the recent past the breed was preserved in southern Italy, especially around Puglia, Lucania, and Sannio. Prior to 1988 the breed was considered very rare. The breed’s name comes from the Latin “Cohors” which translates as “guardian” or “protector.” The breed was recognized by the AKC in 2010. This Italian Mastiff breed is described as being noble, majestic, and powerful. They are a muscular and large-boned breed, but in temperament they are considered affectionate and easily trained. The Cane Corso is loyal and willing to please their owner. At home they are quiet. They are a highly intelligent breed. They are active dogs and do require a good deal of exercise, but they do not try to leave home. They are stable and even-tempered dogs. They do not seek out fights, but they do not back down and they will protect their home and loved ones. They are gentle dogs and wonderful with children. Because of their size and strength, it is best if they have an experienced owner and they should be properly socialized when they are young. Living Environment – This large dog breed is not the best apartment dog, but they can do OK in that environment if they receive plenty of exercise. It’s just not ideal for them. They do best if they have a house with a yard. They can live outdoors if they have good shelter. Grooming – While these dogs do have a short coat, it is not smooth. It is coarse and thick to be waterproof. During cold months the breed has a thick undercoat. This dog breed requires regular brushing about once a week to remove dead hair. They do not shed much unless they are shedding their winter undercoat when they may need extra brushing. Diet & Exercise – Diet should be suitable for large dog breeds. They can be subject to the same bone and joint problems as other giant breeds. Rapid growth when young can result in musculo-skeletal problems, so feed a puppy food for large breed puppies that is designed for slow growth. They need plenty of exercise on a daily basis. Health – These dogs can be subject to the same bone and joint problems as other giant breeds. Rapid growth when young can lead to musculo-skeletal problems as adults. Feed puppies a diet for large breed dogs that is designed for slow growth. Make sure these dogs get plenty of exercise. Otherwise they can have behavioral issues due to not getting enough exercise. The Cane Corso is very intelligent and dog training is relatively easy. They are devoted to their families and willing to please, so training should not be difficult. In fact, training is recommended with a powerful dog of this size. Make sure that you socialize the young pups. They are naturally good guard dogs, so it is necessary to make sure they will be accepting of strangers. These dogs do very well with some basic dog obedience training.